Mary Hill and constant companion Richard at the San Clemente Pier. Life (in the form of lemons) often happens when least expected. When it does, some people make lemonade. San Clementean and longtime resident, Mary Hill, is one of those people. Not only did she make lemonade from her life’s lemons, but she is also sharing her experience in an effort to help others do the same. Some twenty odd years ago - at the age of 37 - with an impressive education from Occidental College, Cal State LA, UCI and the University of San Francisco behind her, Mary Hill was at the height of her career as a teacher and program coordinator. “A stressful but rewarding position,” as Mary puts it, one in which she was enthusiastically coordinating Masuda Middle School’s English language program for foreign students. As springtime approached in that pinnacle year, 1985, it just so happened Mary attended an assembly exploring the debilitating disease, multiple sclerosis. Little did Mary know that a few months later not only would she learn first-hand exactly what the disease meant, but would soon fall victim to its ravages. Upon visiting a doctor for what Hill thought was ‘just the flu,’ she was caught completely off guard when the physician’s examination included the pulling of her big toe. She did not feel the tug, and the doctor requested she have a CAT scan immediately! Sometime after that visit she learned that the “big toe” test could indicate the possibility of neurological dysfunction. As requested, Mary made the appointment posthaste, and accompanied by her father, a retired radiologist, was told the scan machine was unavailable, but that she could be “shoved into a magnet” instead. That magnet was then known as the NMR (Nuclear Magnetic Resonance) and was not as readily available as MRIs (Magnetic Resonance Imaging) are today. “I endured the claustrophobia and clanging of the NMR experience, all the while hoping there was nothing really wrong with me,” Hill remarked, reminiscing the moment. But when called in to look at the films following the procedure, Mary’s first thought was … ‘there’s something wrong with that brain. It has white splotches scattered all over it.’ Standing thoughtfully beside her, Hill’s father then spoke - in his most professional manner - the words that would change her life forever … “you have multiple sclerosis” … and Mary Hill went numb with shock. As feeling slowly returned, Mary eventually put two and two together, remembering those mysterious symptoms she had been experiencing but ignoring. Loss of balance, difficulty walking or standing, blurred vision, loss of fine motor skills, less confidence, frustration, fatigue and much more. It all added up. Mary’s sand beach chair.As news went from bad to worse, Mary was told she would probably have to give up teaching. That was unthinkable to her. What would she do? After the initial shock and fear of the disease abated, she decided she would just ignore it and continue the hectic pace she had become accustomed to. That decision would lead to several relapses and a final realization she could no longer teach full-time nor carry out all her other administrative responsibilities. That’s when Mary Hill took her life’s lemons and began making lemonade. While life has definitely changed for Hill, when speaking about her disease, she chooses to take the high road upbeat and positive saying, “life with MS isn’t so bad.” No longer able to teach in educational facilities, she got involved in the MS Walks, raising $95 that first year. Becoming enthused and more proactive she raised larger and larger funds each year (over $9,000 in 2004) gaining membership in the “Elite Feet” group (top 50 fund- raisers). And before long, she had the inspiration to form the “Hill’s Angels” MS Walk Team, began volunteering for the MS Dinner/Auction and was asked to join the National MS Speaker’s Bureau (after receiving United Way and CFC speaker’s training). For many years before this disease struck Mary swam in the Saddleback College pool, taking evening classes after a full day’s work teaching. She also loved swimming in the ocean. When her career was interrupted, she began swimming at Ole Hanson Beach Club six to seven days a week. During that time she heard about the “Turning the Tides on MS” ocean swim event – an international 38-mile ocean relay race from Catalina to the Santa Monica pier. Determined to participate, she immediately returned to the ocean to begin training for the swim. The actual swim weekend took place shortly after 9/11, giving the MS swim event even deeper meaning and the participants’ greater determination. Mary was treated like a celebrity and felt privileged to meet people from five countries, to become part of a close and caring team, and, on the final leg of the race, to swim with a sea lion pup that played in the water alongside her as she swam. 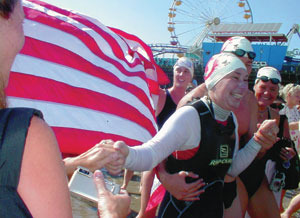 Since that swim she has also participated in the New Year’s Day Polar Bear Swim and the Oceanside Pier Labor Day Swim. Armed with a beach wheel chair, custom-made wetsuit, fins and the aid of her constant companion, Richard, Mary Hill not only trained for the MS swim event, she continues her regime, swimming in the ocean as often as she can. The couple’s basic swim is to the end of the pier and back, and on warmer days they go south behind T-street, on the outside, away from the surfers. Mary finishing the “Turning the Tides on MS” ocean swim event – an international 38-mile ocean relay race from Catalina to the Santa Monica pier. To help her stretch and breathe properly Hill participates in MS for Yoga once a week in Dana Point. She speaks highly of her instructor Michelle Daily, her class participants and especially their “able-bodied” partner/helpers. It is her belief that swimming and yoga have helped keep the MS from progressing too far in the 22 years she has been afflicted. In 2005 Mary Hill teamed up with a CCI (Canine Companions for Independence) Assistance Dog named Indira III, Indy for short. Trained from the age of 8 weeks to 2 years old, these dogs help their companions in a myriad of ways. One of the ways Indy aids Hill the most is when she is giving her public presentations, such as speeches for the National MS Society Speaker’s Bureau. With her dog at her side Mary has more confidence, knowing all eyes are on Indy, taking the pressure off of her. In 1978, with a lot of help from her parents, Mary was able to buy a house in south San Clemente. Like all residents, she loves the small beach town atmosphere of the village and is very interested in keeping the environment and ocean clean and healthy.